I’m a omnivore with carnivore tendencies. There’s no doubt. Look around this blog. Probably five recipes that can qualify as vegan. Maybe less. But Vietnamese works for me. Fascinates me really. The notion that meat is another ingredient. Not the star. Not the focus. Just another supporting voice. It’s very different from the North American perspective. But it’s so good. We can learn something here. These are summer flavours. Clean. Tasty. Not heavy at all. Little bits of meat. Some noodles. Vegetables. Chilies. And nuoc cham. 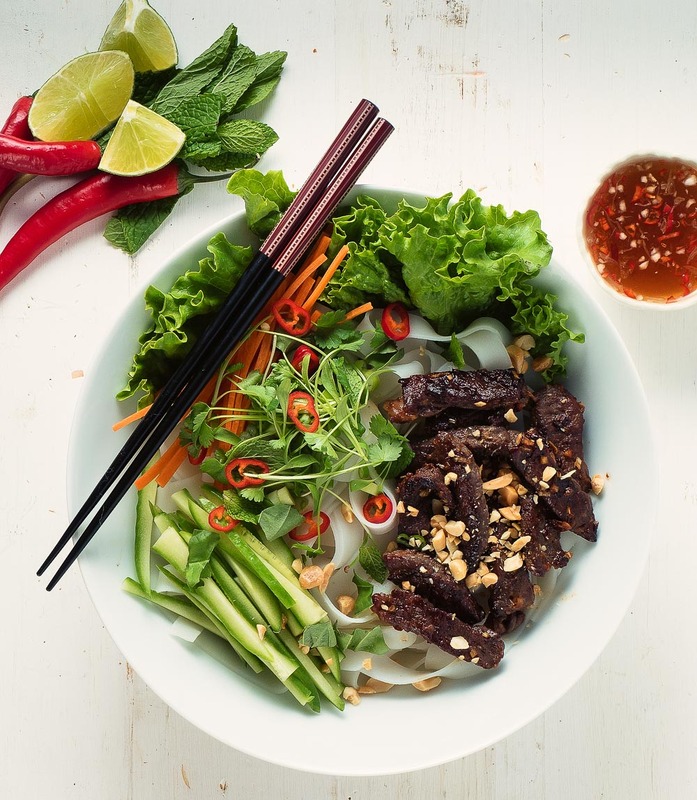 Nuoc cham is that clear drizzling sauce that comes with almost everything in Vietnamese restaurants. It’s great stuff. Just the perfect balance of sweet, sour, spicy and salty. I love it. It takes almost no time to make it. Just combine some ingredients. Heat it a bit to bring it together. Let cool. Ready. Nothing to it. So make it. Make it often. It is killer with fresh spring rolls. 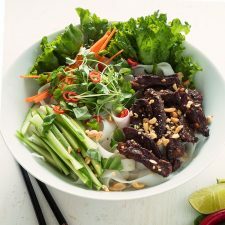 Any Vietnamese noodle salad. And with bun bo xao. There’s not a lot to bun bo xao once you have your prep done. Cook some noodles, fry up some beef and drizzle that crazy tasty Vietnamese dipping sauce overtop. Eat. Enjoy. Feel good. Bun bo xao comes together quickly so have all your prep done before you start cooking. Use rice vermicelli. The noodles in the picture were for effect only. Combine the dipping ingredients in a small bowl and stir to dissolve sugar. You want hot water here to help the sugar along. You can do this ahead of time. Mix the beef, lemongrass, sugar, fish sauce, garlic and sambal oelek and let stand 15-20 minutes (longer is fine). Cook the rice noodles as per the package instructions. Alternately, pouring boiling water to fully submerge the noodles works well. Drain them as soon as they soften - about 5 minutes. Check them before draining. Let the noodles cool briefly. Heat the oil over medium high heat and stir fry the beef. To serve place a couple pieces of leaf lettuce in the serving bowl. Add the noodles. Top with carrot, cucumber, green onion and beef. Garnish with cilantro, basil, mint and peanuts. Pour the nuoc cham overtop. In beef, main course, meat, noodles, vietnamese. Bookmark the permalink.